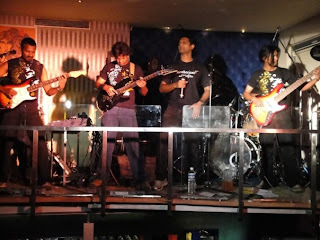 motherjane had last been in town to play at Snehadaan. I went for that show but I honestly have nothing to say about it. Just tears in my eyes every time I think about that place. Visit the place and see the lovely children and you wont take long to understand. The best I can do is post a couple of pictures from the show. 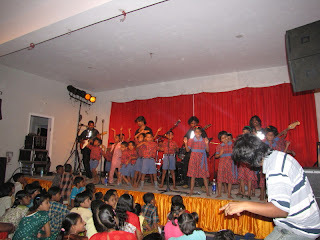 The show was a private one organised for the kids in care of Snehadaan. Anyway, now that I've started talking about that one-off show. Maybe I'll dwell a little bit more about it. the kids were aged from about 4 to 11. They all rushed right in front of the stage and sat down before the show. Their excitement was very evident on their bright little faces. Then motherjane played Mindstreet and the kids were at shock. The kids could be seen covering their ears because the music was really loud and they had no previous encounters with such music before. 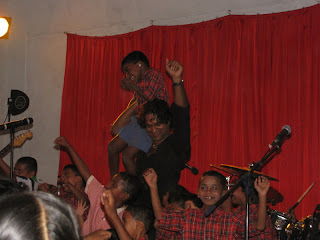 Suraj enthralling the kids and having the time of his life! Suraj then called these kids up on stage and made them dance. The stage which is usually "out-of-bounds" but not on that day. The kids ruled the stage. It was a treat to watch them dance to the tracks which I'm more used to seeing teens headbang too. 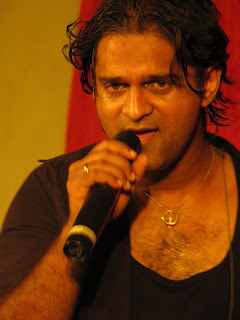 Suraj too, danced about with the kids and it was a treat to watch him with the kids. These are the sort of moments in life that one should be really blessed to obtain. Some boons are bestowed upon very few lucky people. motherjane were one of those few lucky people to have got this chance. To express my feeling about the show would be a Herculean task and nothing short of impossible. However, being one of the biggest janiacs around. 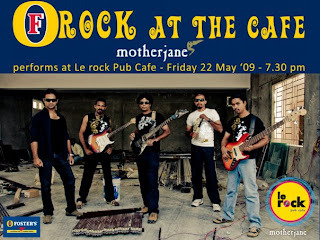 I have to say, though motherjane were on stage and they were playing super quality music. It was the kids who were the real stars that night. The night belonged to the kids! And that would not be classified as an over-statement by any man present there on that night. Fireworks and frightened birds.. motherjane! 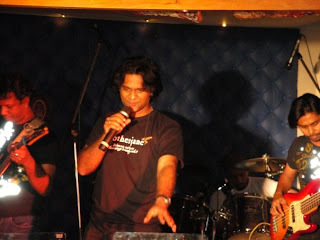 3) Walk right in and say nothing - By Baiju - turns out to be the guitarist - this also turns out to be the only sane idea. Idea no.3 worked and its incredible how the simplest of ideas are the ones that work out. In the end, I just walked right in and the guards didn't bother arguing. So, I was in Le Rock and in for a treat too. The stuff on display and the paintings kept me amazed for sometime. I mean an Ibanez signed by Satriani and a Fender signed by Mark Knoppler. Who the heck needs anything else to live on? motherjane were setting up and getting ready for their gig. My guru, John, was playing a few rudiments which sounded real fun to hear. 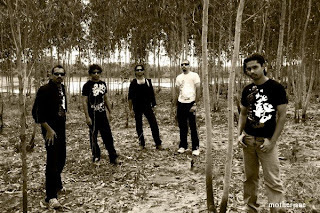 Soon, the whole band chimed in and the next thing you know, they were dishing out Karmic Steps, Fields of Sound, Maktub and Blood in the Apple. 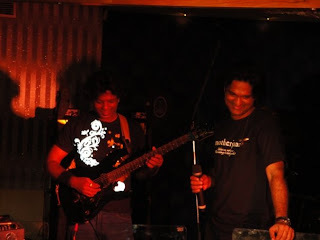 The sound check was soon done and the band was just lazing about for a couple of hours. The next song was Blood in the Apple. A beautiful rendition too. The steady bass lines on that song always appeal to me. And here they were again, putting me in a trance. The say most people go high at the bar. I guess I went high too. Really high. HIGH ON MOTHERJANE & their MUSIC! The 3rd song on the list was Disillusion. The start, sounded a lot heavier. Seems to have been tweaked. But usually Disillusion has a mellow start. Not this time. This time the song started like a blast! A whirlwind of noise that hits you and my the feel of it was great. I had to leave halfway through Disillusion. However, the day was great. I may not have been able to see the whole show. But I saw them live for 2 and a half songs. And technically, I heard them play 5 songs, including the sound check! The day was brilliant fun! & that fact cannot be undermined by any! Below is a video of motherjane playing Fields of Sound. Recorded by Jabri. It also has Baiju playing Vande Mataram. Very soothing to hear. 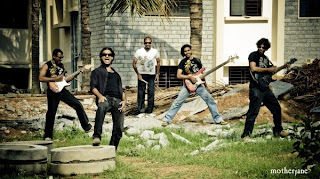 motherjane are next playing in Mumbai on the 29th. Those from Mumbai. Don't miss the show! It promises to be a treat. p.s. motherjane has been intentionally typed in small letters as it is the bands priniciple that the letters should all be in small or in capitals to signify the equal importance of each letter. Awesome theory huh?